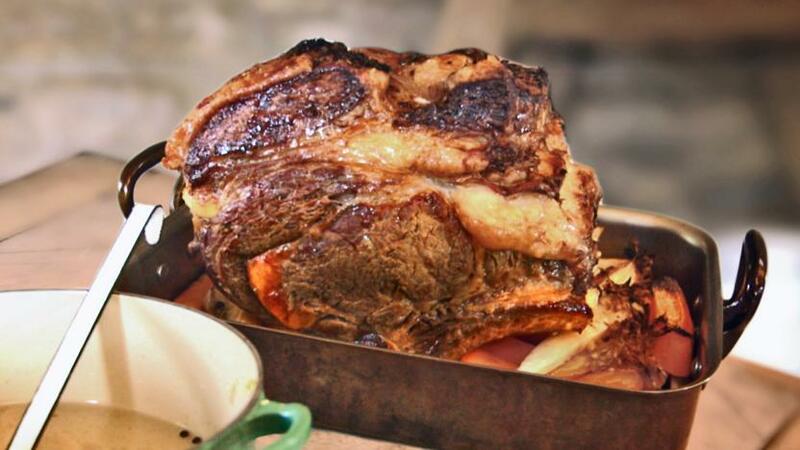 Nigel's horseradish glazed roast rib of beef cooked in beef dripping will not disappoint. Looks impressive. Really easy. Boil the peeled and sliced potatoes in a large pan of salted water until soft to the point of a knife. Drain the potatoes and shake in a colander so that the edges fluff up. In a saucepan, melt the dripping with the horseradish, salt and pepper. Score the beef all over with a sharp knife. Layer all the chopped vegetables in a large oven tray and place the beef on top. Tip the potatoes into another tray. Ladle most of the horseradish glaze over the top of the vegetables and meat (reserving some for the potatoes). Roast the meat in the oven for 20 minutes then reduce the temperature to 160C/325F/Gas 3 and baste the meat with the dripping. Pour the remaining horseradish glaze over the potatoes and place them in the oven to cook for the duration of the beef cooking time. Roast the meat for two hours,basting it with the dripping every half hour. Allow the meat to rest under foil for 30 minutes before serving. If necessary, you could turn up the oven to crisp the potatoes while the meat is resting.